Neodymium magnets and assemblies are used in almost 80% of today’s applications since their extraordinary performance and availability. They are the strongest permanent magnets man can make so far. So when you are considering to use a permanent magnet in your application, put neodymium at the top of your list. Ceramic Magnets, formally named as Hard Ferrite magnets, are made in the same way as the ceramic plates are made. Ceramic magnets are the most economical magnets, so even they are not as strong as neodymium and SmCo magnets but still find lots of applications in the industry and home. such as fridge magnets, office magnets, magnet educations and crafting. It also has more applications in the industry than the other magnets since its low cost, such as toys, motors, relays, magnetic holding, magnetic separation and filtration. These magnets are also very good option for magnetic therapy even though more and more people begin to use neodymium magnets for the health purposes. Some other advantages of using ceramic magnets are non-corrosion and high-temperature resistance. The working temperature of this kind of magnet is around 482 degree Fahrenheit. Ceramic magnets or Hard Ferrite Magnets are molded and sintered. The mold availability is a big factor to consider when you acquire this type of magnet. Even though you may find limited sizes and shapes in our store but Stanford Magnets has much more molds available. Samarium Cobalt magnets, in short SmCo magnets, are sintered rare earth magnets and majorly contain Samarium and Cobalt elements. It was invented much earlier than Neodymium Magnets (known as NdFeB magnets, or rare earth magnet) and also are strong magnets since they are much stronger than ceramic and AlNico magnets. The powerful Samarium Cobalt magnets are majorly used in the industry when the working temperature is higher than 428 degrees Fahrenheit ( 220 degree Celsius ) at which neodymium magnets will lose their magnetism. One of the major drawbacks of SmCo magnets is it is more fragile than the neodymium magnet so it is easier to chip or break. 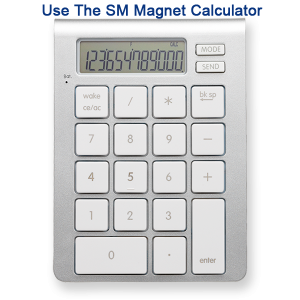 SmCo cost is also higher than the neodymium magnets which have the similar strength. Because of these issues, SmCo magnets are rarely used by regular consumers for their needs, instead the major applications of SmCo magnets are industrial applications which include motors, high-temperature assemblies etc. SmCo Magnets (Samarium cobalt magnet) have two kinds of families: SmCo5 and Sm2Co17. SmCo5 usually is made of three heavy metals of binary and similar metals and cobalt by the ratio of 1:5 compositions. Sm2Co17 usually is made of two samarium cobalt atoms and to 13-17 t atoms. SmCo magnets (Samarium cobalt magnet) are usually obtained by the sintering; sintered SmCo magnets (Samarium cobalt magnet) are brittle and lack ductility. Therefore SmCo Magnets (Samarium cobalt magnet) should be handled with care. SmCo Magnets (Samarium cobalt magnet) have good corrosion resistance, so the surface is usually not processed. Stanford Magnets, Inc custom makes AlNiCo magnets and also inventory these magnets for its customers when they are regularly ordered. Stanford Magnets also has some AlNiCo magnets on the shelf available for purchase.